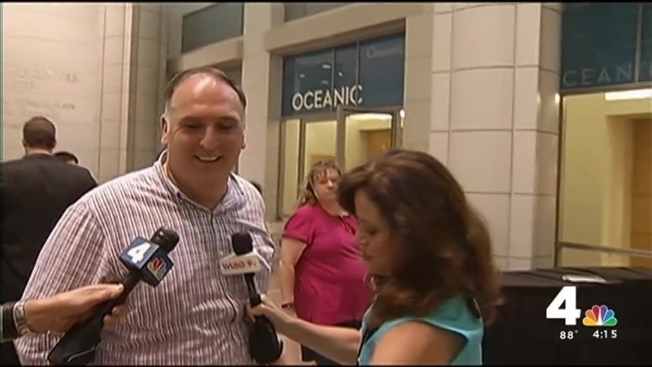 Days after he walked away from plans to open a new restaurant in Donald Trump's upcoming D.C. hotel, Chef Jose Andres said his heart would always be in the building. Andres walked away from a 10-year lease and deal with Trump to run a landmark restaurant at the new hotel after the Republican presidential candidate’s offensive comments about Latinos. The restaurateur said in an interview with NBC4 that he is not likely to reconsider his decision. Though he said nothing about Trump, Andres had nothing but praise for the Trump children running the development. Andres said he walked away from Trump out of respect to his employees and his own status as a new U.S. citizen. Trump Jr. has been quoted as saying he will force Andres to pay out the 10-year lease. Andres had no comment on that. "It's a very iconic building, I love this building," Andres said. "I always dreamed of being a part of this building. A heart of me will always be in this building." Andres spoke at a gathering to honor the 100th class to graduate from the D.C. Central Kitchen's Culinary Training Program, whose main mission is to feed the needy. He received a standing ovation from the audience.